Our Claw Cover® proprietary knit gloves are 21 CFR Compliant, made to fit like a second skin and provide sensitivity busy chefs demand. 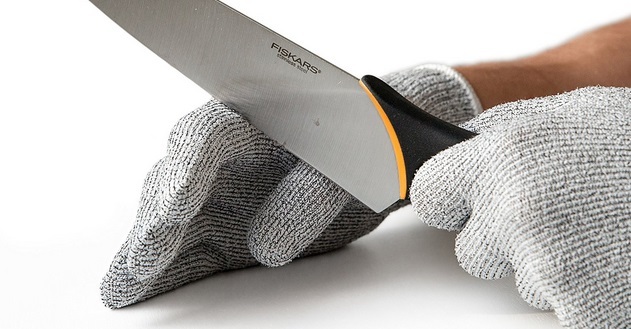 Constructed with significant levels of ANSI Rated protection against common kitchen lacerations, Claw Cover® glove styles feature Microban® antimicrobial treatment that inhibits the growth of germs and bacteria! Available in colors with hi-viz safety accents and in different cut levels, these ambidextrous gloves can be laundered for re-use and cleanliness. We can also custom design a glove specifically for you! All styles can be imprinted with your logo or corporate info, and can be pin tagged for retail display. Please contact our custom design team for a glove to meet your unique operational need.